Simple, but effective. If you’re still struggling with getting the perfect winged liner, or spend too much time blending your eyeshadow, you don’t have to do it every time. I think sometimes it can be so refreshing to do something very simple, that just plays on the natural contours of your face, but still gets the job done. It’s the whole MFBB (My face, but better) approach. 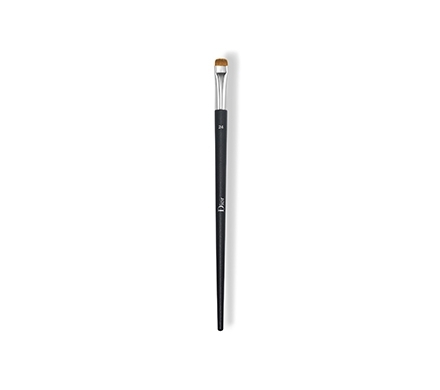 You get your favorite black or brown pencil (I love the Chanel Stylo Yeux – so creamy! ), and you swish a very thin tightlining brush over it to grab some color. In my case, I used the Dior Eyeliner Brush n°24. I normally don’t use it for anything else because I find it too scratchy, but just for packing / tapping on color with very high precision, it’s great! You then run the brush over the second half of the upper eyelid – starting from around the midpoint of your lid, and continuing outwards towards your temple, until such a point where your lashes naturally get sparser. No wing required! But you do have to get in as close as possible to the lashline and darken it, to add depth to your look. This is where a great brush comes in, so take care with your choice, because to keep it natural, it shouldn’t look like eyeliner, but rather, just very dense, dark and luscious lashes. MFBB. Get your eyelash curler if you’re in the habit to do this, and curl away. I have a Shiseido and a Chanel one, and they are both very good (although the Shiseido is much flatter, fyi). Add your favorite mascara starting from the base of the lashes, and you’re done! In my case, I used the Givenchy ‘Noir Couture’ volume mascara. So there you go! Done with eyes! Because the whole idea is to just play on your natural lashline and get in as close as you can, this look should work equally for more hooded eyes. Very quick and simple, but it definitely gave my eyes more depth and made them look more interesting. So, lashes appear thicker, and overall a discreet and super easy look. However, do make sure you don’t continue lining too far towards your temple – it might end up making your eyes look droopy. Hope this was useful, and have fun with it! P.S. Since this eye look is so simple, you could complete it with a bold lip color, if you feel like it!